As the number of different lines producing discs increases, the time taken for changeover of each line was meaning nearly a whole shift had to be used in order to maintain capacity. 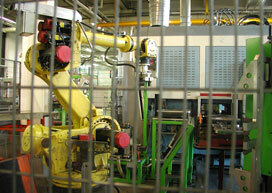 The line has two turning machines, a manipulator robot and a High Speed Machinery (HSM) centre. Worldwide player in manufacturing brakes: its wheels and carbon brakes can be found on more than 2500 aeroplanes in service in the world with 250 companies and 20 Air Forces. Brake discs, are stacked to form a "heat sink" Half the disks turn with the wheel and are known as rotors; the other half attached to the aircraft (through the axle) and do not turn; these are the stators. They are mounted alternately. The friction between the discs therefore ensures braking, absorbing the kinetic energy of the aircraft and transforming it into heat. The term "heat sink" was chosen precisely because the discs reach a temperature of up to 3000°C for an aircraft braking at full speed! 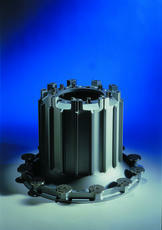 Precision is also a key success factor in braking. With the number of lines manufacturing discs increasing, the line changeover time of X hours (nearly a whole shift) had to be reduced in order to maintain capacity. 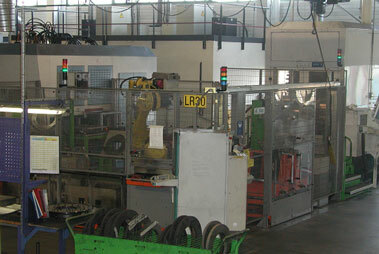 The line has two turning machines, a manipulator robot and a High Speed Machinery (HSM) centre. investment (change of tack, device settings). We got to a changeover time of X/1.9 instead of X hours, so an average reduction of 50%. This was achieved in a few half day hands-on training sessions in SMED and with regular on-site assistance setting up organisational modifications. After investment has been made, we hope to gain more hours still, to arrive at a minimum representing a 60% gain in time. "The introdution of the SMED method to our robotised lines has brought us far more than just an improvement in our productivity and flexibility (with the time reduction at the change of tools). The human aspect and the involvement of each member of the work group (including representatives from all levels of production) has greatly contributed to its success and efficiency."